Nock Co A5 notebooks were launched as part of Nock Co’s Lanier Briefcase Kickstarter’s stretch goal. I didn’t back the Kickstarter for the briefcase but I did jump on the chance when the option was open for the notebooks only. It took a while but I got the notebooks in my hands since late May this year. Then I got bogged down with reviews for other products, it was only recently I broke one out for a test drive. My idea of a test drive is usually a trip with it with friends at a mini pen meet. There, any notebook will be put through its paces via juicy, broad nibs and wet inks. Normally, Nock Co paper products are usually top bound or loose. The Nock Co A5 notebook is the first that breaks this mould. The notebook comes in a pack of 3 and retails at USD$15. It is A5 sized and triple side stapled bound. The exterior is a 100# French Paper Co. Chipboard Kraft with the Nock Co logo embossed on the bottom. I like that branding is so subtle and unobtrusive. Inside is 48 pages of 90 gsm 60# white paper with the Nock Co’s DotDash format in brown. Nock Co’s DotDash is something unique to them as far as I know. It’s a hybrid between the dot grid that I love and the standard grid format I prefer for my to do lists. Somehow it provides the illusion of having lines to write on but breaks it enough to allow me to ignore them at the same time. It’s really hard to describe. The A5 size is a tried and true format. Personally, as a lefty I like the Traveler’s Notebook regular size because of its narrowness but the A5 is my next favourite format. The notebook is great as an everyday carry beater notebook. It’s not something you might want to baby like say a Baron Fig Confidant. It’s something for daily use in the rough tumble of life. 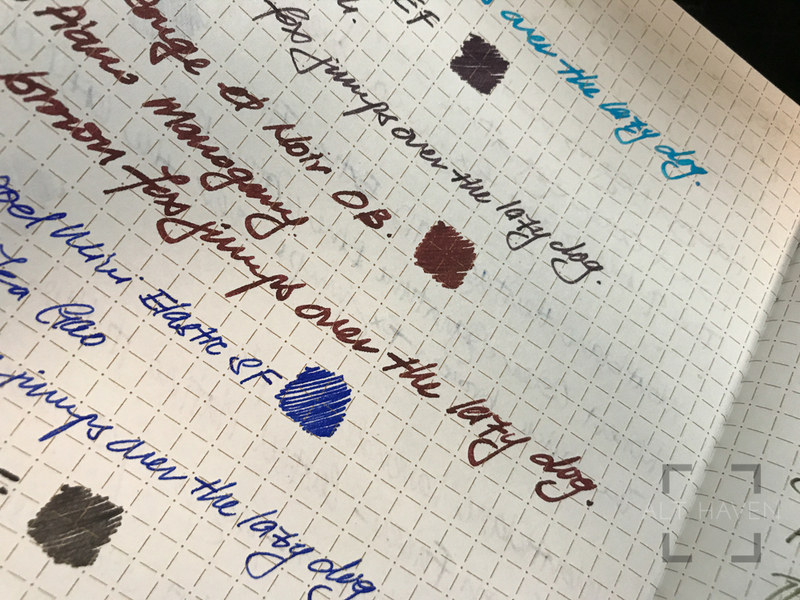 The paper is certainly fountain pen friendly. 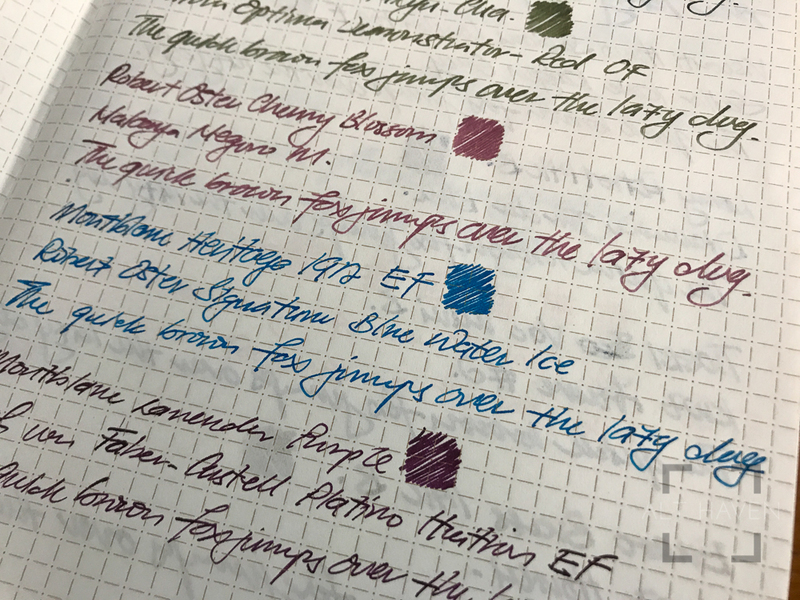 I’ve tried it with a friend’s Visconti Homo Sapiens Crystal in B. Visconti nibs by themselves are pretty wet writers, having it in B is really overkill for me. Then it’s inked with KWZ Turquoise, which if I am not wrong is a lubricated ink. Imagine my surprise when the paper stood up to the juicy B nib just fine. No feathering, no bleed through just some ghosting visible from the other side of the page. The ghosting can be a little hard to see past if that’s something that irks you. 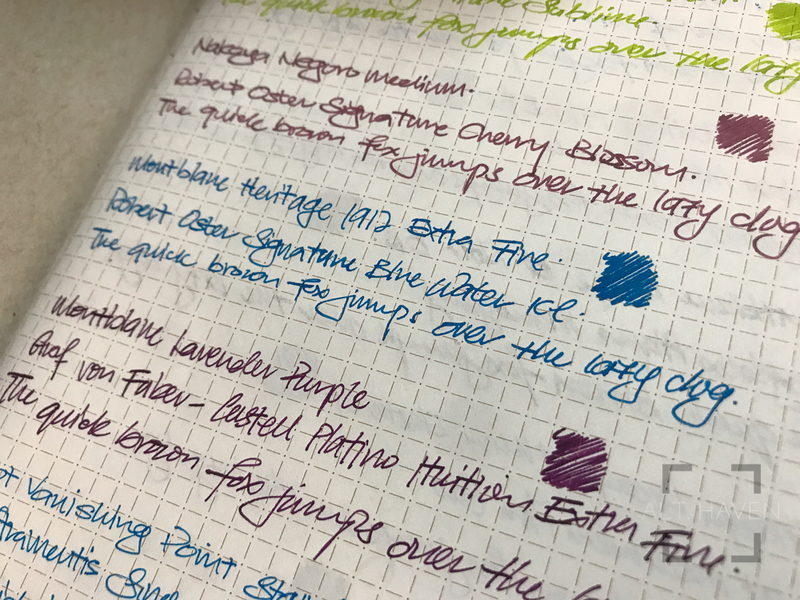 One of the pen and ink combination that had a little trouble with bleed through was my Montblanc Heritage 1912 EF with Robert Oster Signature Blue Water Ice. I suspect the sharpness of the EF nib was the culprit than anything else. Overall, USD$15 for a pack of 3 can be a little pricey for non-US buyers especially once you factor in international shipping costs. However, if you buy one, I am sure the notebook will stand up to the test.